Inside, outside, on the go. ZoomKIT is there for your child, wherever the day takes you. With school, friends, and activities for the kids, our family life can get hectic. Brooke and Brie are at ages where they need a lot of activities and when they aren’t in school, Bob and I have to figure out the entertainment. Whether it is car rides, fun activities at home or being out and about in the world, planning things for our kids can take a lot of energy. It’s amazing what a small item like a portable activity table for kids can help to lessen the impact of a fast-paced life and that is what we found in the ZoomKIT. ZoomKIT is a portable activity table-top that has different inserts available depending on the activity. Brooke loves using her ZoomKIT in her car seat and they can easily be used with strollers or alone. It’s become a wonderful snack table that the kids love to use in our little kid ‘nook’. 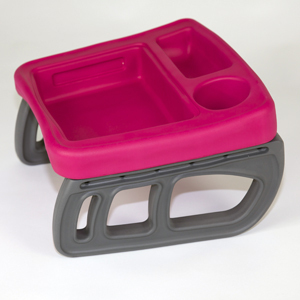 The ZoomKIT is designed to hold modular, swappable activity cases filled with education and entertainment kits, mess and slip-free food containers, and packaged foods. It is so easy to use and it is simple to keep with you on-the-go. Bob and I love that as Brooke is slowly growing out of a need for a portable activity table, Brie still has about three or four years worth of use in our ZoomKIT. It is so nice to have a snack, art and activity table that is always stocked and simple to clean. Where I see the biggest impact is in our car rides where Austin traffic can literally be at a stand-still for long periods of time. The kiddos can get a little antsy, especially right after school, of being stuck in their car seats and having a fun art table in their laps with things to do has been so helpful for Brooke. ZoomSNACK – a bento-box styled lunch box with a removable, tethered “no-drop” spork, and hinged lid. Dishwasher and Microwave Safe. BPA and Pthalate free. ZoomART – Creative kit features illustrations and activities by artists. Used alone or inserted into the ZoomKIT travel table. ZoomART includes: a dry eraser easel, a reusable dry eraser activity book with mazes, dot-to-dots, and matching games, a coloring book and both dry eraser markers and crayons with easy to use holders. ZoomIN fill it yourself boxes. These empty hinged lid “tupperware style” boxes are perfect for your little one to store their favorite toys and items to take along. WeeZOOM – Sensory activity kit with zippers, locks and buttons to keep minds and hands busy and learning. ZoomTEK – A digital tablet insert to hold Ipad minis, Kindle, Nook or other small tablets. The TEK has a touch screen holder/safety cover and a 3-day battery life. ZoomPLAY – A series of road games, play boards and more. ZoomSINK – This is a hygiene kit help your child finish getting ready; mirror, toothbrush, hairbrush, lotion and wipes. Great for traveling or long commutes. ZoomKIT table-tops comes in colors “Hibiscus” dark pink and “Pacific” deep turquoise.